JNN 16 Feb 2014 Rome : Members of the Italian Muslim community have come together to discuss problems facing the religious minority, highlighting Muslim contributions to the Italian economy and complaining about lack of official status for the second largest religious group in the country. 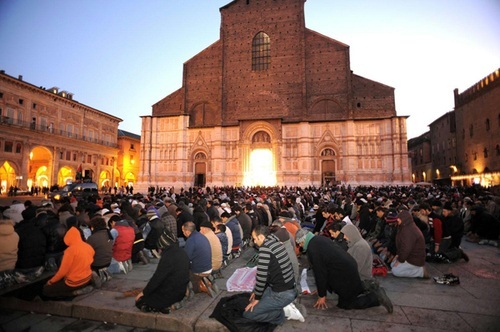 Figures from the national statistics agency “Istat tell us that there are currently about 1,700,000 Muslims in Italy,” said Izzedin Elzir, Florence imam and head of the Muslim umbrella group Unione delle Comunità e Organizzazioni Islamiche in Italia (UCOII), ANSA news agency reported. “There are over 700 mosques,” Elzir added. The Florence imam comments came during his meeting with other members of the Muslim community at the special conference for Muslims held on Tuesday in Rome. The conference was held at the Niccolò Cusano University and was attended by leading members of the Italian Muslim community. Speaking at the conference, Elzir referred to Muslims contributions in the Italian economy. “Muslims account for 4-5% of national GDP. In other words,” Elzir said. Despite the “added value” the Muslim community brings to Italy, they have no official status, the imam added. “Despite the fact that freedom of religion is enshrined in the Constitution, the absence of a resulting law had led to the Muslim community’s de facto not being recognized by the Italian State, with which there is no agreement”, in the likes of those regulating relations between Italian institutions and religions other than Catholicism (with which relations were set down in the Concordat). Similar agreements were entered year ago with other minority religions, such as Judaism and Buddhism. Agostino Cilardo, expert in Islamic law at the Naples Orientale University, shared a similar concern. “The problem of a lack of representation is a concrete one, not only an official one,” noted Cilardo. “When you draw up an agreement, the counterpart is a unified organization. But who can speak on behalf of Muslims in Italy,” he said. The lack of official status means Muslims organizations are not eligible for funding through the Italian law that allows taxpayers to allocate part of their taxes to a religious group of their choice. Efforts to recognize Islam in Italy, even unofficially, are often slammed by the separatist Northern League. Plans by Italian Prime Minister Enrico Letta to establish a museum of Islamic art on the banks of the Grand Canal in Venice has also sparked angry reactions from separatist Northern League. Plans by regional councils to build more mosques have also been slammed. This entry was posted in Europe and tagged Community, italy, Izzedin Elzir, Milan, muslim community, Muslims, Population, the Italian economy. Bookmark the permalink.